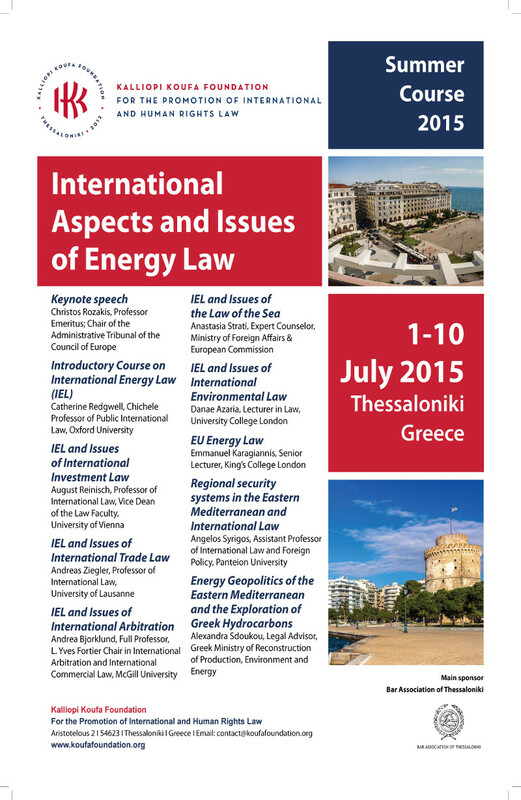 The first Summer Course to be hosted by the Foundation in the historical city of Thessaloniki from 1 to 10 July 2015 examined the ever-increasing importance of energy law and was titled “International Aspects and Issues of Energy Law”. International Energy Law is a field in motion. From the industrial revolution onwards energy considerations have shaped international politics and in the last decades, international energy law has developed dynamically: sharing of energy resources, transnational investments in the energy sector, free trade and state subsidies, the proliferation of international energy agreements and the ensuing disputes, energy security and the environmental impact of energy activities are only some of the pressing issues that international law is called to regulate today. The inaugural session of the Thessaloniki Summer Courses, organized by the Kalliopi Koufa Foundation, offered an intensive, 10-day course that introduced the subject of international energy law and examine its links and interaction with various relevant fields of international law, such as environmental law, investment law and arbitration, trade law, law of the sea etc. The Thessaloniki Summer Course on International Aspects and Issues of Energy Law was open to students, especially LLM students and PhD candidates, researchers and practitioners from all over the world with a keen interest in the topic. In the framework of the course, participants had the chance to engage in discussions and interact with some of the most renowned scholars in the field. 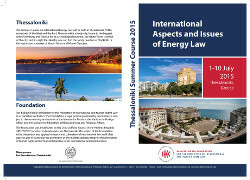 The 2015 Thessaloniki Summer Course included an introductory as well as several specialized courses on international energy law. In addition, participants attended a series of lectures, workshops as well as roundtables offered by academics, experts, policy advisers and practitioners. The entire session was in English. Please view here for more information on the faculty and the provisional programme of the session. You can also find the poster and the leaflet for the 2015 session of the Thessaloniki Summer Courses. The 2015 Session of the Thessaloniki Summer Courses was sponsored by the Thessaloniki Bar Association and financially supported by Mr. Athanasios Martinos family. Subscribe to our Newsletter or Like us on Facebook to receive updates on the 2018 Thessaloniki Summer Course and the other activities of the Foundation.